Pes cavus is a foot deformity in which the medial longitudinal arch of the foot is excessively high and remains that way when weight is put on it. Approximately 15 percent of the world’s population has pes cavus, and of those, 60 percent develop pain with the condition. High arches can cause problems such as pain while running and toes that cannot be straightened. Pes cavus is the opposite of flat feet, and it is not as common. This condition can be hereditary or acquired, and most commonly associated with orthopedic, neuromuscular, or neurological conditions. For example, if you suffer from a neuromuscular disease, you may experience changes in your muscle tone, which may lead to the development of pes cavus. The deformity can be located in the forefoot, midfoot, or hindfoot. The patient may notice that the front of the foot is inordinately lower than the heel when the foot is lifted and examined. Problems can arise for someone with pes cavus, which places more stress on the metatarsal bones than flat feet. Athletes are commonly affected by this condition. Difficulty wearing shoes is one common problem. People with pes cavus need more support, either from special shoes or orthotics, to accommodate their high arches and to prevent symptoms. Symptoms such as weakness and fatigue may also appear, especially if the victim also suffers from a neuromuscular disease such as muscular dystrophy. Unstable ankles may also be a symptom, especially for someone whose hindfoot is twisted inward or who has weak peroneus brevis muscles (this is the muscle that extends up the calf from the outside of the ankle). How Is Pes Cavus Diagnosed? If you feel like you have pes cavus and are experiencing any of the symptoms listed above, you should see a podiatrist. Your doctor will ask you questions about your medical and family history. He or she will also perform a physical exam and imaging tests to determine the severity of the condition. X-rays and MRIs (magnetic resonance imaging) of the feet and spine may also be conducted, along with an electromyography—which checks the health of the muscles and the nerves that control the muscles—or a nerve conduction study, which measures the speed of electrical signals through a nerve. How Is Pes Cavus Treated? Treatment for pes cavus is usually determined by the severity of the condition and the symptoms involved. Your podiatrist will want to increase the degree of contact between your arch and the ground and prevent excessive supination (movement of the subtalar joint) and pronation. The goal of treatment will be to provide stability and support to the arch during weight-bearing activities such as walking or running. Additionally, the relationship of the heel to the lowered forefoot will be addressed with appropriate heel elevations or counseling on appropriate footwear. Corrective shoes may improve walking ability and reduce pain. Orthotics such as arch inserts and supportive insoles can help with mild to moderate cases. 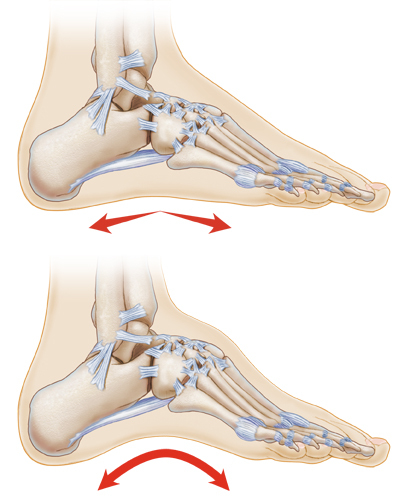 In severe cases, surgery may be performed to flatten the foot. If there are any other problems, such as a neurological disorder, the patient will be referred to a specialist in that particular field. If an underlying condition exists, your doctor may recommend a change in footwear or orthotics in conjunction with treatment for the underlying condition. In severe cases of pes cavus an ankle foot orthotic may be needed to treat the foot, ankle, and lower leg weakness or instability. Stretching or strengthening exercises may be prescribed to neutralize the effect of contracted posterior leg musculature and weakened muscles in the front of the leg. Your long-term outlook will depend heavily on the cause and severity of the condition. You may begin to experience relief within hours of changing your shoes or adding orthotics such as arch supports, but your recovery time may be weeks or months if you have an underlying condition such as cerebral palsy. Can Pes Cavus Be Prevented? Unfortunately, some people have high arches due to heredity. In these cases, the condition cannot be prevented. If you naturally have high arches, you should be evaluated for underlying orthopedic or neurological conditions. What Are The Complications of Pes Cavus? Should I watch for symptoms of this condition in my children? How long should I wait to contact you if symptoms do not disappear with treatment? If this happens, what other treatment options will be considered? Which over-the-counter orthotics work best for people with pes cavus? What would benefit me more, custom-made or over-the-counter orthotics? Which part of my foot is this condition affecting? How long will my recovery take if surgery is needed? During that time, will I need to limit my normal activities? Do you have a brochure about this condition that I can take home?